Today I’m excited to review my dear friend Ally’s new cookbook, Ally’s Kitchen: A Passport for Adventurous Palates. You may know Ally from her popular blog, Ally’s Kitchen. In this unique book, she shares her favorite recipes from around the globe and lets you wander the world without ever leaving your kitchen! What struck me immediately about the cookbook is how visually stunning it is. This book screams Ally with its beautiful, colorful photos that just jump off the page. I love all of the little details that make it unique just like the author herself- passport stamps, cultural backgrounds, personal stories, and “food branching” ideas. She encourages readers to go beyond the recipes in the book and have fun experimenting in the kitchen, taking chances with flavors, textures and unexpected combinations. All of these things take this above and beyond a run-of-the-mill cookbook and make it an entire experience- a Bohemian Bold experience, as Ally would call it. The book is conveniently broken down into sections based on geography. With Ally, you’ll travel the globe experiencing classic European flavors and healthy Mediterranean dishes. You’ll discover Middle Eastern flavors, African spices and Asian sweets and savories. You’ll even some do some island hopping to experience the flavors of the Caribbean. Ally adds her own personal stories to the recipes- she’s led a very exciting and full life with lots of adventures! I felt like I was living vicariously through her when I was flipping through this book. I’m honored that Ally included one of my recipes in this lovely book. My Adriatic Feta Tomato Shrimp Skillet is a dish that I created after my honeymoon in Greece and is so close to my heart. When you read this cookbook, you really will feel like you’re traveling the world without ever leaving your home. I invite you to go along with Ally on this boholicious journey- I guarantee it will be a wonderful ride! Makai Paka (corn in a coconut curry sauce), Camaroon Banana Crepes with Ground Walnuts and Chocolate Drizzle, Singaporean Grilled Glazed Salmon and Syrniki with Blueberries (cottage cheese pancakes). But since it is Mother’s Day, I wanted to make a recipe that I know my mom would enjoy for brunch. And although my mom and I are very different in this regard, she’s never had a sweet tooth (she doesn’t even like chocolate, if you can believe that!). So ultimately, I decided to make Ally’s Greek Eggs with Spinach, Mozzarella & Cherry Peppers. My mom loves egg dishes and I’m a huge fan of Greek flavors so I knew this one would be a hit. Plus, I couldn’t resist trying this recipe once I read the story about a young Ally being swept off her feet in Greece by a gentleman named Maurice. This recipe was easy to make, used simple ingredients and all came together in one skillet. 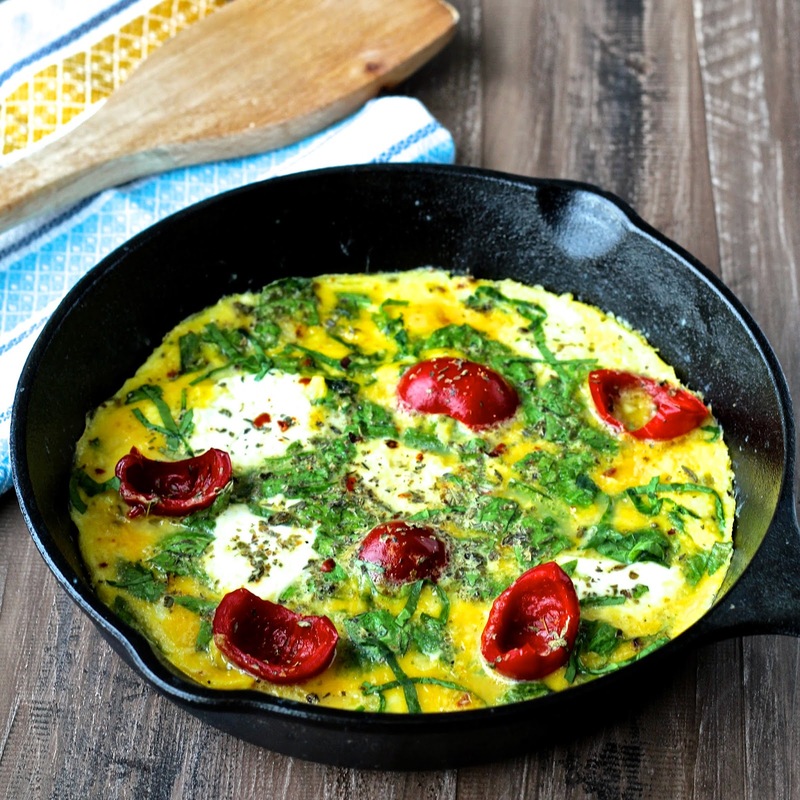 The combination of eggs, tangy peppers, creamy cheese and Greek spices was perfect! 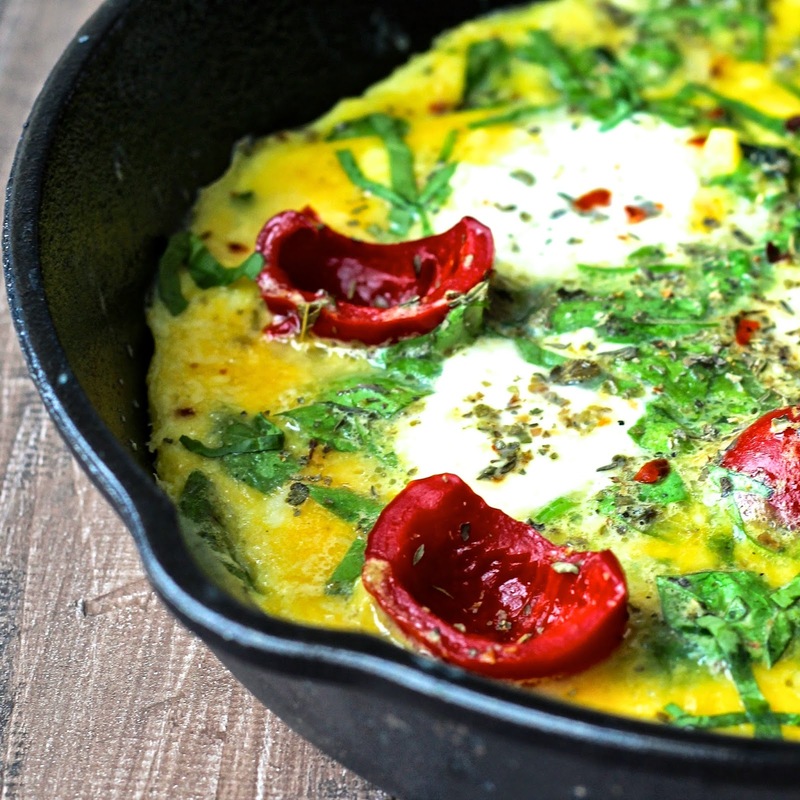 Eggs, tangy peppers, creamy cheese and Greek spices all come together in this easy one skillet breakfast! In a small (4- or 5-inch) cast-iron skillet over medium heat, melt the butter. In a mixing bowl, combine the eggs, yogurt, salt and chili flakes; mix well. Add the spinach and basil and just give one or two stirs. Pour the egg mixture into the skillet. Add the mozzarella and cherry peppers and sprinkle Greek seasoning on top. Reduce heat to medium-low, cover with a lid, and cook for about 3 minutes. Remove the lid and use a rubber spatula to gently lift up the edges of the egg mixture, tilting the skillet slightly to let the uncooked eggs run under the bottom. Cover and cook another minute or two. Do this two or three more times until the eggs are completely cooked. When done, serve this straight from the skillet. If there are two hungry mouths, share by cutting it in half. I can hardly believe that someone doesn't like chocolate, Sonali! On the other hand, I know even having quite a sweet teeth, I would easily ditch out a dessert to have such a lovely and hearty meal! You know, especially if you have desserts quite often, you get eventually sick and tired of them and want something simple and savory:) By the way, all the other recipes you might have made do sound amazing as well (especially the crepes and salmon), and I'm kind of hoping to see them on your blog, sooner or later! Sonali, your Greek eggs photos are mouthwatering and your review equally enticing. Thank you for this sumptuous synopsis of Ally's cookbook! I'm looking forward to making your Adriatic shrimp. Sonali – I didn't know Ally before reading your post – but now, I feel I know her – such a wonderfully warm review and what a delightful dish! I am so intrigued – I don't think I've ever had eggs made with Greek yogurt and Greek seasonings before! Thanks Jennifer! You can find them at the deli bar of a lot of grocery stores. This looks right up my alley, Sonali! We have eggs for dinner every Thursday, so I know for sure what's on the menu this week! That's awesome, enjoy! Thanks Katie! this is my kind of meal..
Sonali, this looks delicious and congrats on the feature! Fiance and I are thinking of Greece as our honeymoon destination too 😀 Mnnn, eggs. Thanks for sharing – I love ethnic foods! Thanks Natalie! Greece was amazing! We spent time in Athens, Santorini and Mykonos, they were all incredible but for a honeymoon, Santorini is a MUST! 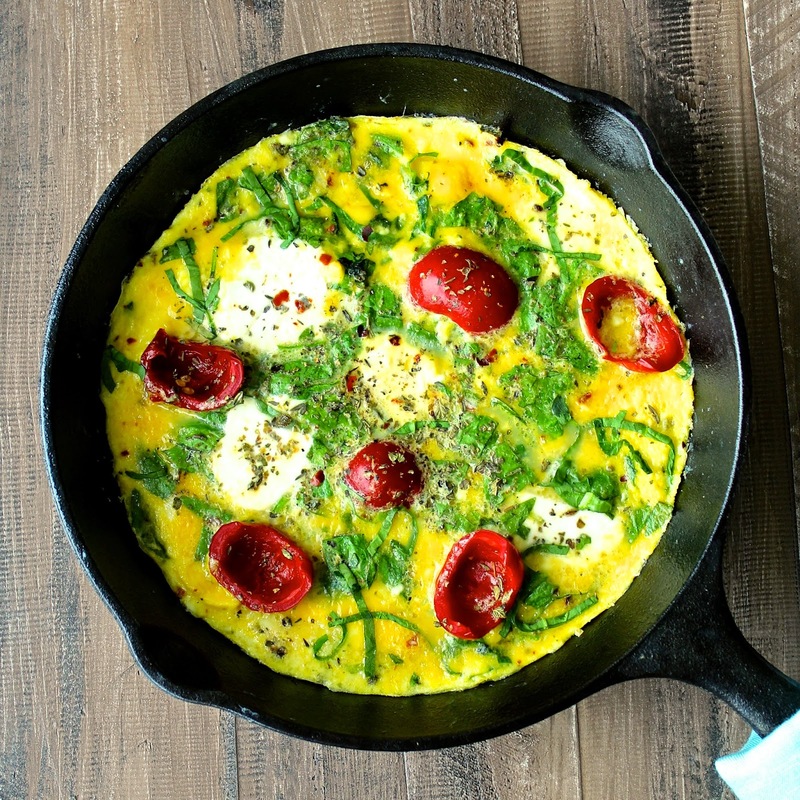 These eggs look wonderful and so does that cookbook! The Singaporean grilled salmon sounds wonderful! Thanks Kelley! And yes, that salmon looks awesome! These eggs sound super yummy! I prefer sweet breakfasts, but if I'm going savoury there's a very big chance eggs are involved. Those banana crepes from her book also sound delicious! Thanks Gen! My husband always gets the sweet brunch dish and I get the savory and then we share…the best of both worlds! 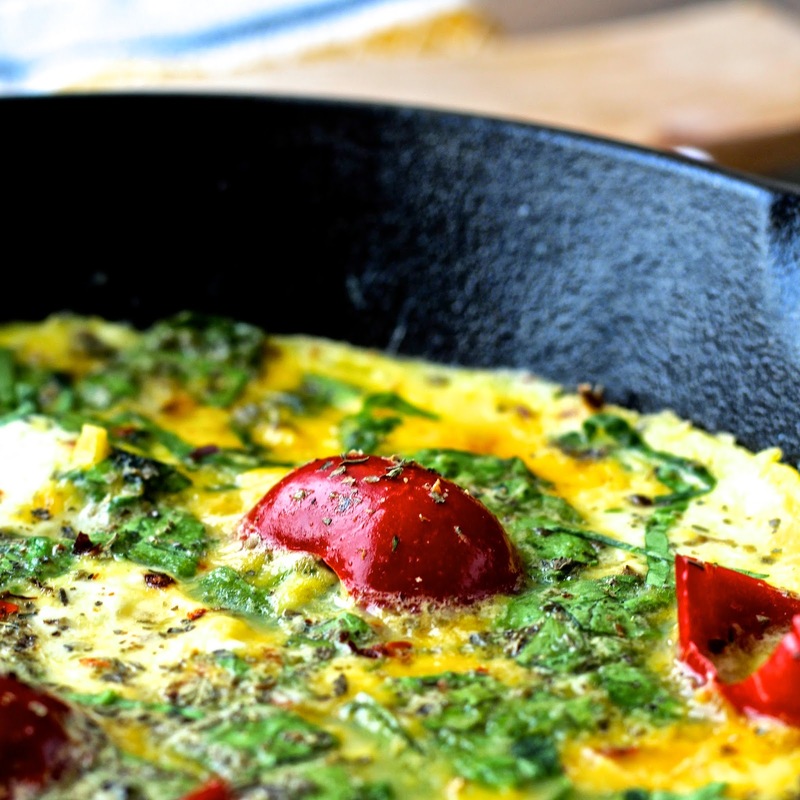 I am just so distracted by this GREEK OMELET – OMGGGG!!! The only solution is to eat it all up to get rid of any more distraction! While riding the "Magic Carpet" through the cookbook, this recipe called out to me. I am so looking forward to trying this, and many more of Ally's recipes! Thanks Erin! I really love the book and hope you do too! WOW! This is a stunner. And that cherry pepper looks astounding. Delicious and YUM!. Thanks Anu! The cherry peppers definitely add an awesome burst of flavor! This egg dish looks beautiful, and yummy! I like how the book is organized by locations with her travel notes / experiences – what a refreshing approach to writing a cook book! my mom doesn't like chocolate too! I can never get that! This dish looks stunning and all the recipes in that book have me drooling, I need to check it out! You can never have too many cookbooks so I love discovering new authors! Love the flavors in this greek eggs dish. It is perfect for breakfast or dinner!